Happy Easter, & a Completion! Happy Easter everyone! I hope you’ve had a lovely celebration with your friends and family, and if you don’t live close to them, I hope you’ve had a lovely celebration in creating wonderful things! Mr A & I didn’t do Easter eggs this year. It’s the first time in a long while, but I feel good about it. We instead spent that money on fabric for the NICU outfits I posted about previously. 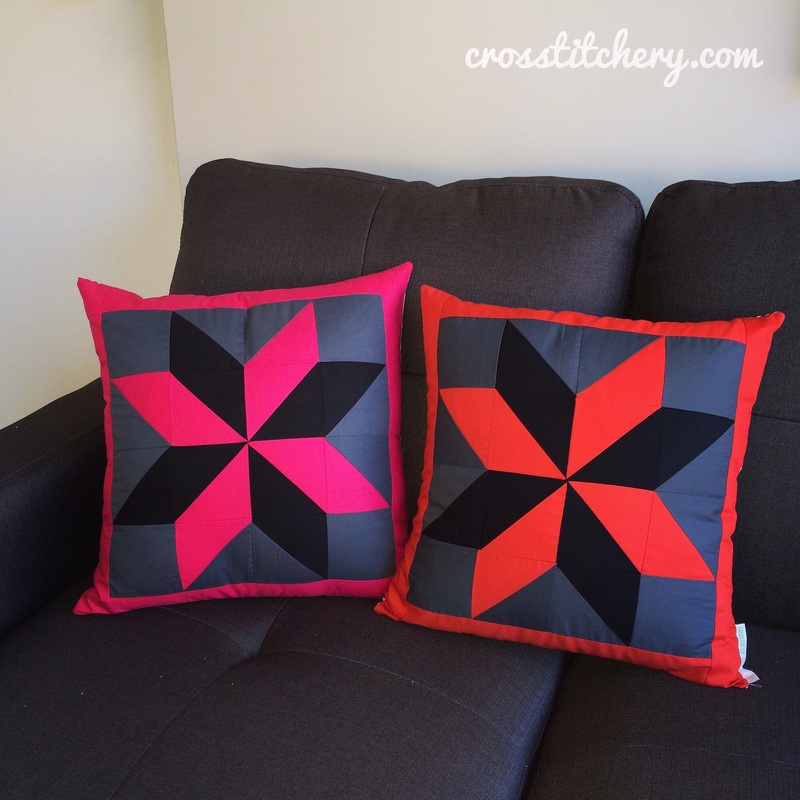 More about that fabric later, because this post is about my recent completion .. More cushions! This commission is for a couple who are soon to be wed – in about 2 weeks actually! Their friend requested something personal for their big day. 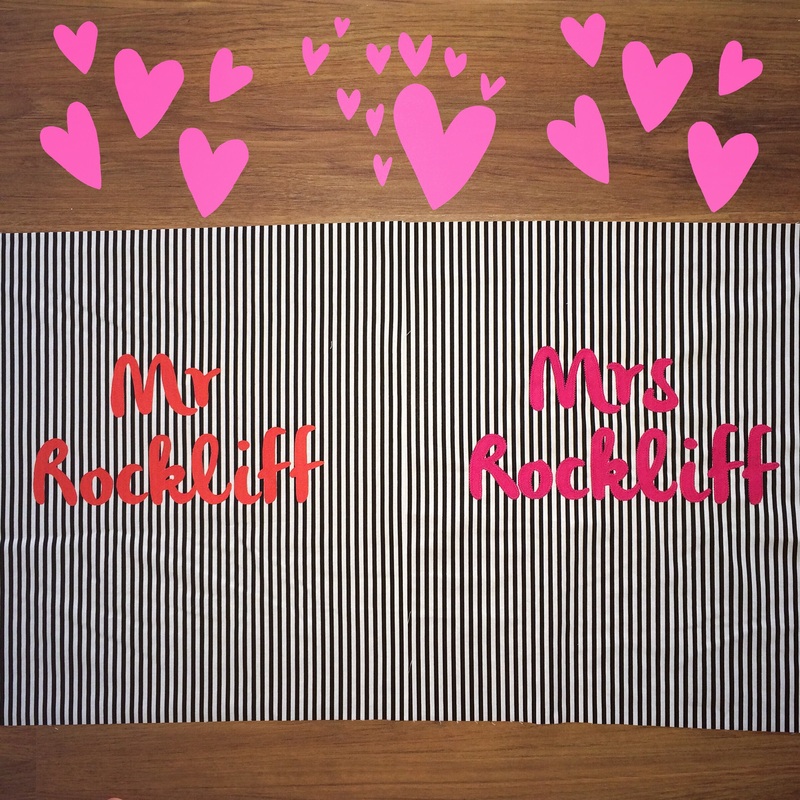 After some research, I found out this couple’s house is decorated in red and gray, and the soon to be wife’s (Mrs Rockliff) favourite colours are pink, grey and black. Here’s what the cushion tops look like. 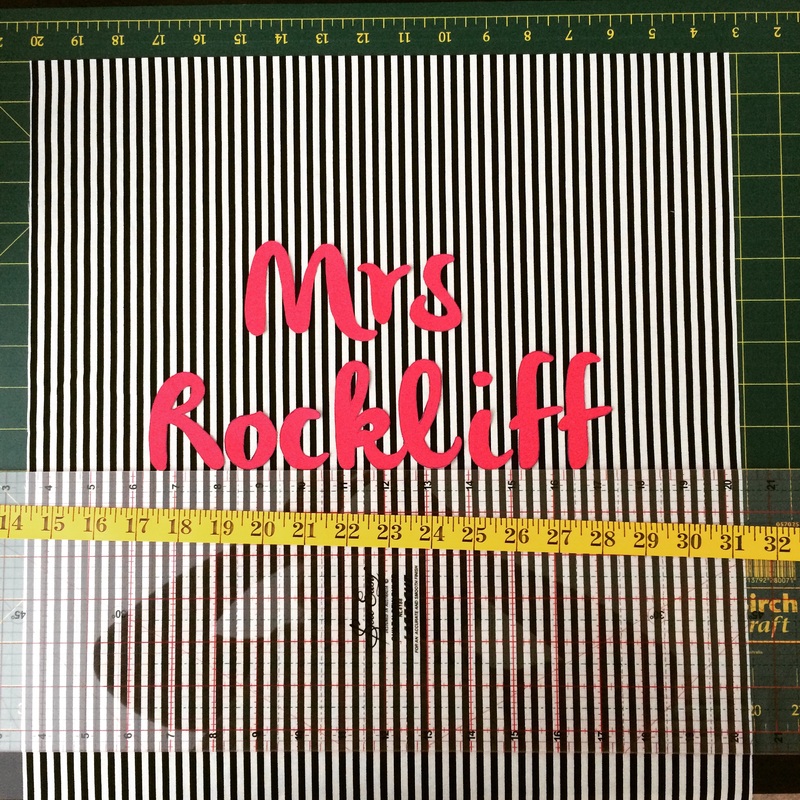 I did a starburst pattern with a thick border in each colour, as I really wanted to pattern to stand out and for the cushions to be easily recognisable as Mr Rockliff and Mrs Rockliff. 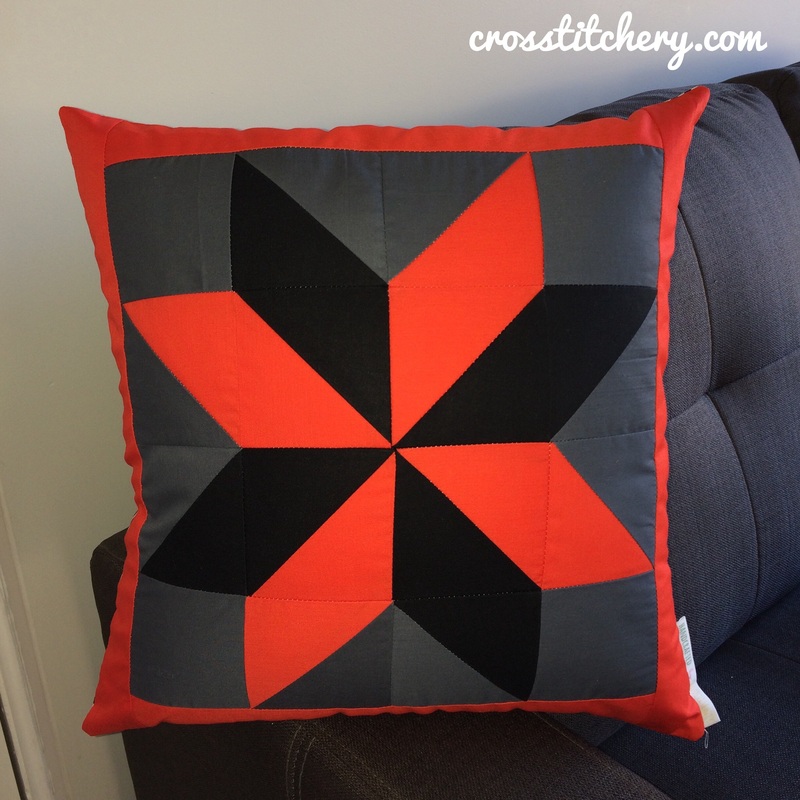 After hearing about the couple’s home décor, I thought a geometric, clean line cushion back would be best. 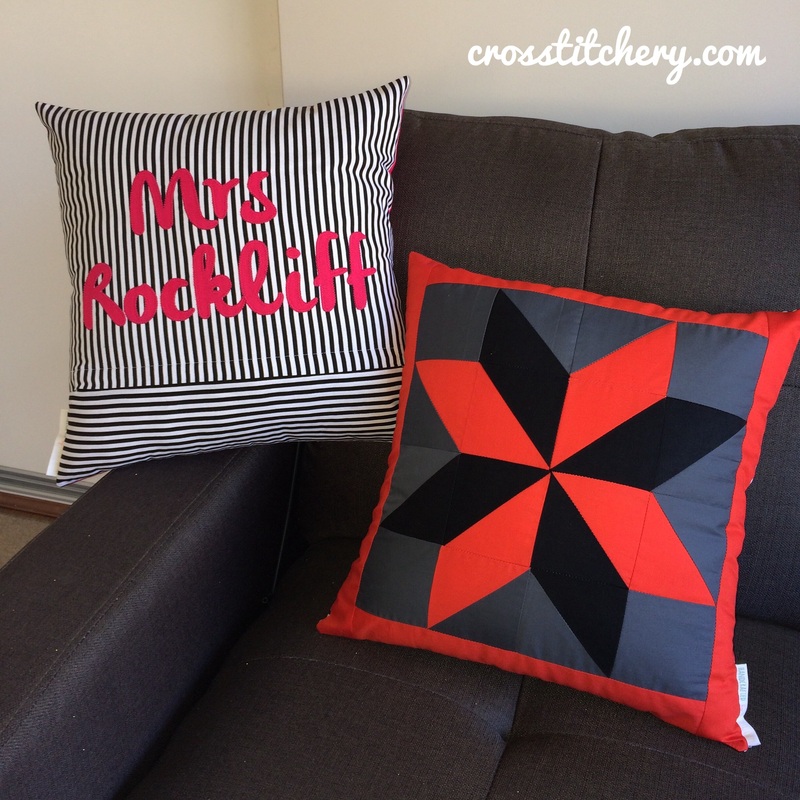 My plan was to applique Mr Rockliff, and Mrs Rockliff into their respective cushions, in red and pink fabric to match the front of the cushion. I had fun making sure the words were centred and straight hehe! I decided to take a photo of the back of the applique for once, because I never focus on that part. You can see below the stitching, and my use of stabiliser whilst appliqueing. 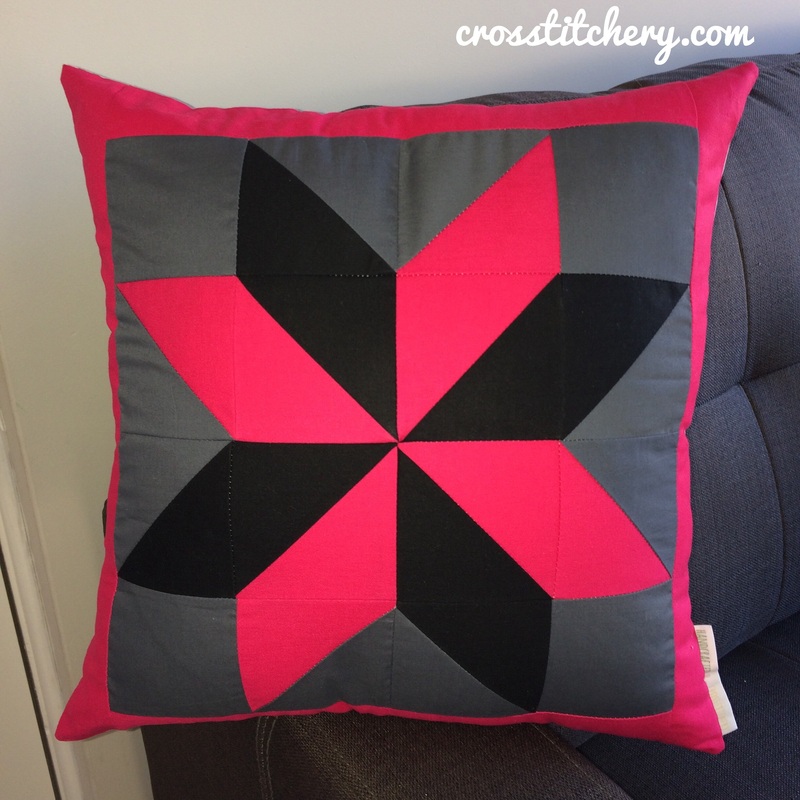 I used a lapped zipper installation for this cushion cover, but I’m going to write a separate blog post for that, as there’s a fair bit I want to mention about it. Originally the plan was for all lines of the cushion cover to run vertically, but I had some issues with the lapped zipper part of this cushion cover, which meant that the back wasn’t going to fit the front anymore, because it wouldn’t have been long enough. I’ll admit, I had a tiny little melt down because I had already finished the applique by this stage, and I thought I was going to have to start again. I took a day’s break from this commission to think it through, and decided the back would actually look much better with some horizontal lines in it. Now that this is completed, I’m actually really glad I went with a vertical block, and a horizontal block. 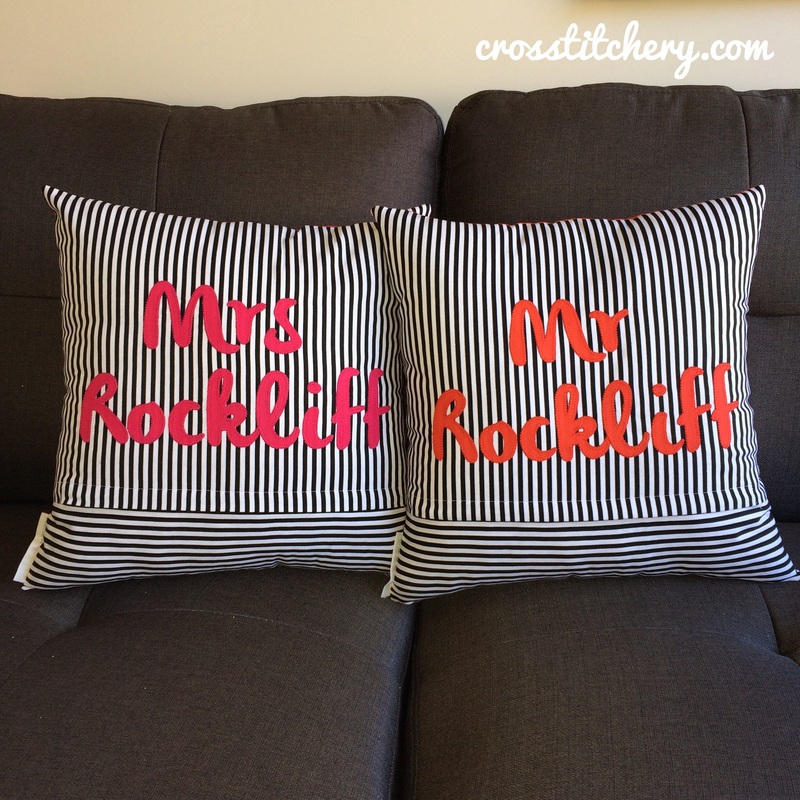 I’m happy with the cushions backs turned out on this completion, as I think the couple’s names really pop out. 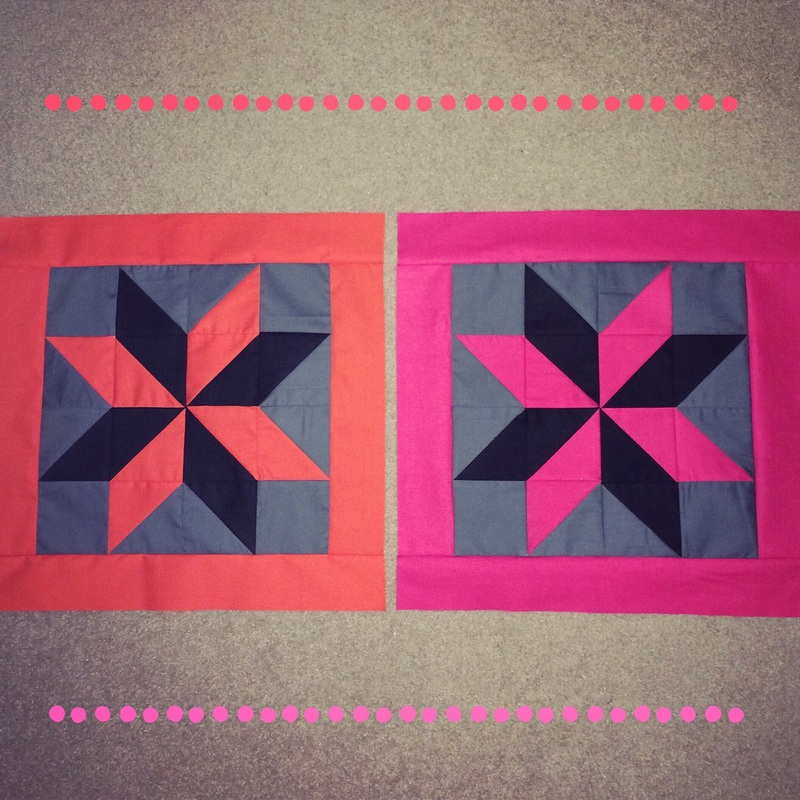 The finished cushion size is 16″, and I put a 18″ cushion insert into them. I like how the cushions have more depth with a large cushion insert in them, not to mention they’re a little snugglier! You made a so very gorgeous job! I love the pillows so much!! So fun! What a great gift idea. I love the starburst. I know it seems silly to say but I never thought of doing that. You’ve totally inspired me. Thank you! !